Three social responses have resulted from the change-over to cotton-cropping as the predominant replacement ecology. These responses include attempts to (1) remedy the actual environmental impacts of this dramatically altered landscape; (2) improve the resilience of the regional economy, anchored primarily on cotton production; and (3) better the health and other prospects for the region's dense network of cities and towns. In this final section, we explore these three areas. Soil erosion and groundwater depletion are the two most problematic environmental effects of development for local, regional, and national groups. Both the rain and the US Soil Conservation Service were responsible for reducing the amount of seriously eroded land following the tragedy of the 1930s. Congress appropriated thousands of dollars for lands granted emergency status in the spring of 1935. By the 1940s, proper tillage implements, contour ploughing, terracing, and other soil-management efforts were in wide use. Viewing the Dust Bowl disaster strictly in terms of environmental damage, however, reveals only part of the story. The consequences are intertwined with various social and ecological institutions and factors. The vulnerability of the Southern High Plains to such complete devastation is a human artefact. Individual farmers using ill-considered farming practices with little thought to the possibility of massive erosion, the pressure from the larger society to produce more, and the support from government institutions in the form of loans and credit all contributed to the creation of the Dust Bowl. Underlying the environmental disaster was the widespread human toll. Whole communities, founded in agriculture but now the places of education, trade, communications, medical care, legal services, culture, and identity, were deeply shaken or destroyed. Farming brought these people to the Llano, but their homes, neighbours, and communities kept them there. Vulnerability developed and rested on a fragile environmental foundation. Source: South Plains Association of Governments (1991). a. Does not include New Mexico. To this end, the Committee suggested eight objectives, which together formed a far-reaching comprehensive plan for maintaining environmental integrity and life and livelihoods for the millions who lived in the region. The first two objectives focused on sustainability of the highest possible standard of living and an economy capable of withstanding the "shocks of recurrent periods of drought." The Committee also sought programmes for relief and assistance designed to bring self-reliance and solvency to the people, and the local institutions and governments. Another objective focused on stabilizing land tenure and farmer occupancy to reduce out-migration. Furthermore, the Committee recommended reorganizing the community structure of the Plains, to distribute more efficiently social goods like education, health care, and court systems, with the added benefit of reducing "social isolation." Along with this, they recommended a new tax system to lower the tax burdens and bankruptcy rates of farmers. Finally, and most important to the Committee's way of thinking, they proposed to "[a]rrest the wastage of soil by erosion and make efficient use of the water resources of the region" (GPDAC 1936, 9). To achieve this final objective - stopping soil erosion in the Dust Bowl - the Great Plains Drought Area Committee drew up several radical land-use reform proposals. Starting from a re-division of land into environmentally defined sub-areas, submarginal lands could be permanently taken out of "commercial production" and replanted as grasslands. Soil-conservation practices, including terracing, stripcropping, and shelter belts, would be required on arable lands. Recognizing a link between ownership and conservation, the Committee recommended extending public credit to tenant farmers so that they might buy the land they farmed, on condition that the new owners operate their farms "according to rational principles of soil and water conservation" (GPDAC 1936, 15). A form of crop insurance was proposed to help mitigate the variability of rainfall. The principal objectives of the Drought Area Committee have been echoed many times over the past 55 years, as the Plains endured the subsequent droughts of the mid-1970s and early 1980s. But the foundation of ecological understanding the Committee brought to its work has been missing. Noted ecologists such as Aldo Leopold, Frederic Clements, and Paul B. Sears have been invoked and, in the case of Sears, even appointed to head federal land-reform programmes (Worster 1979). Nevertheless, the far-reaching plans of the various agencies and administrations developed to mitigate and counter the conditions that contributed to the Dust Bowl era must not be overidealized. Very few programmes were realized in their entirety, and certainly the cooperative spirit considered fundamental to the future of the Plains could not be mandated. Currently, because of the highly erodible condition of much of the land in the Southern High Plains, over 20 per cent of the agricultural area has been placed under contract within the US Department of Agriculture Conservation Reserve Program (CRP). In some counties the sign-up rates are over 25 per cent. Only nine states in the entire country have more land in the CRP than does the study area. In the 20 county areas around the city of Lubbock, nearly 608,000 ha are out of production either voluntarily, as part of the CRP, or awaiting final approval for the CRP. The popularity of the CRP is due to erosion problems, of course, but also the weather was not conducive to dryland farming for the few years prior to the initial sign-up period. Some farmers went out of business (15-20 near the city of Lubbock alone), their land sold by loan institutions. Many more decided to farm fewer hectares (G. Underwood, personal communication, May 1991). One could argue that the real reason the Dust Bowl has not reemerged to the same extent as in the "dirty thirties" has been the incorporation of new technology, such as sprinkler irrigation, into agriculture. Irrigation has long been a response to the semi-arid climate of the study area. Coronado saw Indians irrigating crops in the south-west in 1541 and archaeological evidence suggests that irrigation existed long before that in the Trans-Pecos region. To the east, on the Southern High Plains, irrigation began only when the groundwater could be effectively lifted to the surface of the land. The history of irrigation in the study area is recounted in several texts, the most notable being Donald Green's Land of the Underground Rain (1973). The Southern High Plains aquifer system is part of the High Plains regional aquifer that underlies about 450,660 km� of parts of Colorado, Kansas, Nebraska, New Mexico, Oklahoma, South Dakota, Texas, and Wyoming (Weeks 1986). The system consists mainly of near-surface deposits of late Tertiary or Quaternary age (Gutentag and Weeks 1980). The Ogallala Formation of the Tertiary age, the principal geologic unit, consists of heterogeneous sequences of clay, silt, sand, and gravel deposited by braided streams flowing eastward from the Rocky Mountains (Weeks 1986). Since the Ogallala rests primarily upon impervious shales ranging in age from Permian to Cretaceous, only those parts of the Plains in which the Ogallala is thick enough to supply reasonable yields have adequate groundwater for irrigation. Prior to development in the late 1930s, saturated thicknesses of the aquifer ranged from 0 to 120 m in the study area (Cronin 1969). By 1980, the saturated thickness had been reduced by more than 30 m in some areas. Because of the high potential evapotranspiration and the relatively low precipitation in the area, potential recharge to the aquifer is quite low, areally averaging far fewer than 25 mm per year. This means that the aquifer is essentially non-recharging for all practical purposes and that regional declines will continue as long as irrigation occurs. The problem of declining water levels in the High Plains regional aquifer began to attract the attention of the public in the early 1970s. The threat of exhausting the water supply in an area of heavily capitalized agriculture during a period of spiralling fuel costs and market expectations generated a congressional mandate to conduct an intensive study of the problem. The six states of the High Plains Ogallala Region and the Economic Development Administration of the United States Department of Commerce formed the High Plains Study Council to carry out the study. The congressional effort was not the first concern over the depletion of the aquifer. Several researchers (e.g. Kennamer 1959) had remarked on the uncertainty of sustaining irrigated agriculture in the area. A 1957 study projected the end of the water supply by the mid-1980s (Persons 1957). Heightening awareness of the issue was the 1970s boom in wheat and corn exports that fuelled the expansion of irrigation northward into Kansas and Nebraska. Soon, every state in the High Plains was experiencing water-level declines and escalating production costs. Figure 6.6 depicts the net depletion of the Ogallala aquifer from 1963 to 1987. Once again, however, the most popular solution to the problem (declining water levels, this time) in the Southern High Plains was institutional intervention. Rather than reduce dependence on irrigation, plans were devised in the Texas legislature to import water from east Texas, the Mississippi River, and even the Columbia River in the north-western United States. Such elaborate schemes of canals and pipelines over thousands of miles represented the type of technological fix the people of the Plains had come to expect for solving environmental problems. Even more recently, the US Army Corps of Engineers (1982) conducted analyses of water-transport schemes that would draw upon the Arkansas and other rivers to the east as part of the High Plains Regional Study. Because the estimated price tags of these transfers were in the billions of dollars, because farmers would increase their water costs by at least one order of magnitude, and because easterners were not inclined to support "mega-water projects" for western farmers, the plans were shelved. The only feasible response to the alarming rates of decline was an extensive water-conservation programme, at least in the Texas portion of the study area. Groundwater-management institutions covering much of the study area were organized in the early 1950s. Most of the irrigated area in New Mexico was included in "controlled basins" supervised by the State Engineer's Office in Santa Fe. The State Engineer's Office then estimated the amount of water in storage and allocated water rights to ensure that the water would last several decades, long enough to amortize long-term capital loans. Texans, insisting on local control of resources, established a large district managed by a popularly elected board of directors. Over most of the Llano Estacado in Texas, water-users' associations of individual counties coalesced into the High Plains Underground Water Conservation District No. 1 through a series of local elections in the early 1950s. The use of demand management and well-spacing helped to reduce water use and inefficiency. The programmes, and especially the Texas programme, were strikingly successful. In the early days of irrigation on the Llano Estacado, a well was drilled on the high point of a field and water was transported to the field in unlined, open, earthen ditches. Losses ranged from 10 to 30 per cent per 300 m (or about 1,000 ft) of ditch. It was common practice to irrigate rows slightly less than 1 km long in 12-hour sets. Considerable over-irrigation occurred at the low end of the field - runoff from the fields was usually about 20 per cent of the water pumped. The installation of approximately 10,000 miles of underground pipeline and more than 3,000 tailwater return systems, plus reductions in the length and time of irrigation sets, resulted in nearly a one-third decrease in pumpage. Furrow dike installation and other land-management practices maximized the effective use of precipitation and helped to reduce further pumpage. Time-controlled surge valves and sprinkler systems reduced water pumpage by 10-40 per cent on many farms (Wyatt 1988). In 1977, the 46 counties of the Texas High Plains had a total of 3,645 centre pivots. By 1988, 3,384 centre pivot sprinkler systems were operating within the 15-county High Plains Underground Water Conservation District No. 1 service area (Wyatt 1988). These sprinkler systems cost around US$30,000 each, representing over US$100 million dollars committed by farmers toward conserving (and using) the underground water resources of the Ogallala aquifer. Surge irrigation systems cost considerably less but still entail a significant financial investment. Government commodity and conservation programmes, land and water resource-management practices, technology investments, high fuel costs, global market trends, and water depletion - all of these are responsible for reduced irrigation in the study area in the 1990s compared with the 1970s. Quantifying the effects of any one of these factors is not feasible in this study. Overall, however, the number of farmers and labourers has declined owing to this overdetermined ecological-economic dynamic, as has the wealth produced by the region. Almost 300,000 fewer hectares (about 700,000 acres) were irrigated in 1989 than in 1984 (Cross Section, 1991, 2). Groundwater depletion exacerbates the riskiness of the cotton economy of the Southern High Plains. Yet most farmers believe it is the only crop capable of supporting them (Underwood, personal communication, May 1991). Vegetables have high water requirements, peanuts require contracts (although there are some "wildcat" growers in the area), and the corn grown for the local Frito-Lay plant is "maxed out." Corn also has fairly high water requirements. Some farmers have begun growing grapes in the last decade or so. These prime-quality grapes sell for US$400/ton, and, although production may increase, it is difficult to imagine that grapes will sustain the region to the extent that cotton has. Ultimately, no matter what crop is irrigated, the groundwater will be gone. The Ogallala portion of the High Plains regional aquifer is essentially non-renewable - all use is essentially mining. Careful conservation can extend the water supply that is the foundation of the existing economy of the Southern High Plains, but economic diversification and dry farming are the long term solutions to sustainability. Is change possible on the Southern High Plains? Can diversification of the agricultural economy lessen dependence on an inherently unstable foundation? Some believe that future livelihoods cannot be made here they argue for a great parkland reservation, a "buffalo commons," with the removal of what they view as "unviable" communities (Popper and Popper 1991). As an alternative, attempts have been made to integrate less capital-intensive (and less water-intensive) crops into Llano Estacado agriculture, and also to broaden the manufacturing/industrial sector. Neither has been very successful. The overwhelming dependence of Southern High Plains farmers on cotton as a cash crop has troubling implications for the regional economy. Attempts to diversify agriculture speak to the vulnerability of the economy, to fluctuations in the global and national markets, to yearly weather risks, and to the long-term environmental effects of monoculture. In the aftermath of what was now unmistakably recurring drought, civic leaders in Lubbock, the largest city in the Southern High Plains, sought advice from outside experts on how to diversify and expand the Southern High Plains economy. In 1958, Cresap McCormick and Paget, a management consulting firm based in Chicago, released its extensive study on the prospects for the Southern High Plains economy, with Lubbock as its hub. The study noted positive aspects of the Southern High Plains but deflated many projects favoured by the city leaders. For example, despite the many transportation links to east Texas and the West Coast, the consultants pointed out that the major consumer and industrial markets were east of the Mississippi River and that, practically speaking, the hinterland surrounding Lubbock extended chiefly to west Texas and eastern New Mexico, an area it already served. Likewise, on the positive side, a "sizeable, growing, relatively stable and productive supply of labor" existed that was, moreover, "largely nonunion" (Cresap, McCormick, and Paget 1958 III-8). Detracting from this asset, though, were the largely unskilled nature of the labour and the relatively high wage rates. "Right to Work" laws notwithstanding, the higher wages were a major factor in the area's inability to attract spinning, knitting, or fabric mills, the most likely value-added manufacturing activity (given the local cotton crop). The mills were and are much less expensive to operate in the south-east United States and overseas. Overall, the report concluded, the most likely path to success for the Southern High Plains economy was what it already had - irrigated agriculture, with minor transshipment activity aimed at the "Texico" region. All potential prospects raised by community leaders - fabric mills, food product manufacture, oil-seed mills, transportation and distribution centres - were all deemed largely infeasible. The Southern High Plains region was (and remains) simply too remote and too limited in natural resources and attributes to flourish as anything but an agricultural region (Cresap, McCormick, and Paget 1958). A brief flurry of industrial influx during the prosperous 1960s brought some economic diversity to the area. A Holly Sugar plant located in Hereford, Texas, to mill the local sugar beet crop (Dunn 1986). Yet sugar beets have never really been established as a major crop on the South Plains; throughout the 1980s, sugar beet crops accounted for only a small percentage of the total agricultural production of the South Plains. A Hanes knitting mill announced construction plans (never realized) for a site in Lubbock County. Frito-Lay, Inc., which expanded its operations in the 1960s, remains one of the few major manufacturing employers in the region. The cottonseed-oil mill cooperative is also an important industry, although not a major employer. These efforts, however, are all agriculture based and are dependent on the future of farming on the Llano Estacado. By and large, the consultants' report seems to have been accurate. Manufacturing currently provides a mere 8 per cent of employment in the Southern High Plains, whereas the service and retail sectors provide about 65 per cent. What this implies, unfortunately, in terms of diversification, is that value-added manufacturing and industrial activity represent a very small segment of the economy, with the further implication that the new capital necessary for investment to generate more growth is non-existent. The importance of value-added manufacturing, whether agriculture based or not, cannot be overstated. As the bedrock of a healthy economy, value-added enterprises offer the sole means of bringing private capital into a regional economy to continue the chain of economic investment and development. Federal investments in the region, other than shrinking farm subsidies, are limited to a few public-works projects, chiefly high-way building. Opportunities to establish new non-agriculture-based businesses are thus very limited. Furthermore, as the Small Business Administration representative of the South Plains Association of Governments emphasized, the spectacular collapse of the savings and loan industry in Texas has essentially eliminated loans or credit for the establishment of new enterprises or businesses in the region (T. Pierce, personal communication, May 1991). Despite, or perhaps because of, technological advances, institutional innovations, and agricultural adaptations designed to make replacement of the cotton-culture ecology more permanent, the farming communities of the Southern High Plains are in many ways more at risk than ever (Farney 1989). Efforts to diversify the economic base have not been very successful, and smaller communities have continued to lose population, services, and revenue to the bigger, less agriculture-dependent cities. Nevertheless, these fragile small towns both support and rely on the larger urban centres for information, higher education, and medical care. Two-thirds of all hospital beds in the Southern High Plains, for example, are in Lubbock (South Plains Association of Governments 1991). The larger cities, in turn, need the people of the small towns to use their facilities (a recent hospital survey reported that 42 per cent of all patients at a major Lubbock hospital were not residents of Lubbock) and to create revenue through sales, restaurant, and entertainment taxes. As competition increases for continually decreasing capital, and as chances for new income-generating industries moving to the Southern High Plains diminish, all economic activity consists of "slicing the pie a little thinner" (T. Pierce, personal communication, May 1991). These late-twentieth-century, fully articulated communities are slowly facing the reality of sustaining a complex way of life in a region that specializes in a single activity. The need to diversify is well understood, and over the past 40 years various interest groups on the Southern High Plains have sponsored feasibility studies on potential income-generating activities. For a variety of reasons, such as remote location, an unskilled labour force, and an uncertain water supply, very few actual value-adding operations have been created. The heavy dependence on agriculture has continued. The erosion of the agricultural base has rippled through the Southern High Plains economy. One of the most important effects is the loss of jobs in the agricultural and agricultural-support sectors. The latter includes distribution of agricultural chemicals, supply of agricultural equipment, and maintenance, seed production, and processing and milling operations. These last two - processing and milling operations - employ many people and have the highest value-added impact. Another important effect of the diminishing role of agriculture for the communities of the Southern High Plains is the attrition of other economic sectors. As the capital generated by agriculture slowly shrinks, so does the attraction for investment in the region as a whole. Decisions to locate businesses in the Southern High Plains include assessments of the robustness of the economy prior to a move into the region. A steadily increasing pool of available unskilled labour does not offset the growing lack of cash circulating in the local economies. Unable to attract replacement industries, the communities of the area have nowhere to turn in the face of the predicted (and seemingly inevitable) shrinkage of agriculture. Outside experts predict agricultural viability up to 50 years, basing their assumptions only on how long the water will last, given a free flow of technological innovations (Farney 1989). Various informed sources in the region, considering social viability, credit availability, limits on capital, markets, and water, estimate a 10-15-year horizon for agriculture's prominence (Lander, personal communication, 1991; Pierce, personal communication, 1991; Steglich 1986). Given nearly a decade of relatively poor rainfall, even the near future appears ominous. It is difficult, of course, to predict the future trajectory of the Southern High Plains. Clearly, however, the region will accommodate less irrigated land and more dryland farming. It is also unlikely that new land will be brought into cultivation (Riebsame 1990). The question remains as to what will become of the other lands, abandoned by farmers, either through bankruptcy, retirement, or lack of accessible (or affordable) water. Perhaps more land will be converted to wildlife refuges or other reserves. A positive economic trajectory for the communities of the Llano Estacado depends upon achieving sufficient diversity to reduce the region's dependence on irrigated agriculture. One measure of possible futures is employment forecasts based on studies of economic growth, technological change, and industrial and occupational trends (Texas Employment Commission 1988). Overall, projections of employment prospects for the Lubbock to Amarillo region suggest little growth over the next five years (Texas Employment Commission 1988). Forecasts project a growth rate of 1.9 per cent (or 5,514 jobs) for all employment demand (growth plus replacement) across all job categories, from surgeons to unskilled day labourers. Only 1,915 of those jobs represent actual new jobs, and no single employment category is expected to experience actual growth (Texas Employment Commission 1988). Predictions for the Amarillo Standard Metropolitan Statistical Area (SMSA) are identical, with even fewer jobs in the new -job category. Zero demand is predicted for farmers and farm managers, with a growth prediction of a mere five jobs by 1995 for general farm labourers. And again, the largest sources of employment in the Southern High Plains economy of the near future are professional jobs, especially health related and sales and service. This is not an optimistic prospect for economic growth in the region, which lacks a manufacturing base to replace farming as a generator of wealth. Efforts to diversify the agricultural economic base of the Southern High Plains are clearly limited. Expansion into other forms of agriculture simply reinforce the difficulty of maintaining farming in this windy, semi-arid former grasslands environment. Attempts to broaden the manufacturing-industrial sector have likewise stalled. Adding a layer of social expectations to this situation increases the challenge for diversification. Cotton has dominated the Southern High Plains for 50 years - most of living memory. And, despite the very high level of risk involved, cotton has promised the reward of a standard of living set in the 1950s and 1960s. What must be understood is that this way of life on the Southern High Plains has been created and maintained by two outside factors - technological innovations and institutional arrangements, generally in the form of government interventions (both state and federal level), and financial arrangements, chiefly in the form of the extension of credit. In Texas, the state's Department of Agriculture, through its agricultural experiment stations and extension services, has provided invaluable research and support for farmers on the Plains from the turn of the century. Developments in irrigation technology were matched by credit arrangements to provide the capital essential to adopt that technology. Although this sort of cooperation has benefited farming throughout the United States, on the Southern High Plains it is clear that agriculture would not have flourished, or even survived as long as it has, without it. 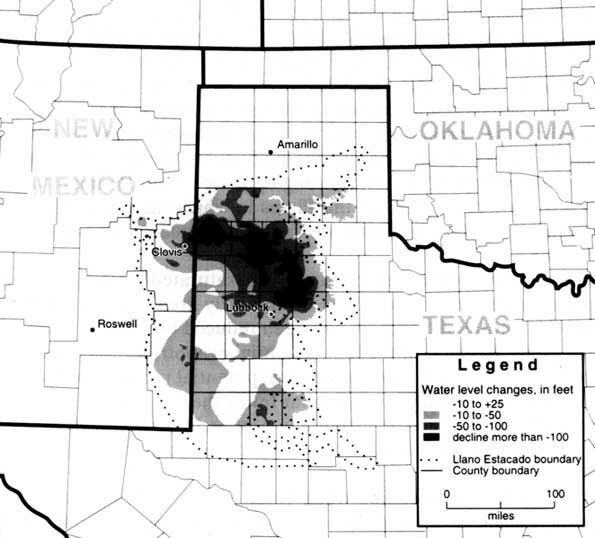 The finite supply of water underscores reality and the future of the Llano Estacado. Increasing costs to pump water from ever-increasing depths will determine how long the water will "last." The scaling-back of government programmes, props really, throughout the farming sector has hit the Llano Estacado severely. The retreat of technological and institutional resources has returned the people of the Plains to essentially the situation encountered by the original European settlers that of the individual pitted against the uncertainties of climate and competitive markets. The question becomes: What sort of life is possible with the environment as it now exists and with the resources that can be extracted? Many people believe that agriculture will not last long into the future. What, then, will the people of the Plains do? Institutional support for maintaining the settlements of the Llano Estacado enjoys a long-standing tradition, dating from the earliest attempts to establish permanent agriculture-based communities. The social history of the Southern High Plains is essentially a history of institutional and technological devices to overcome what was environmentally untenable - rainfall-based agriculture. From the Four Sections Act in 1887, to the Agricultural Assistance Administration in 1933 and the price-support programmes and federal farm subsidies in the 1970s and 1980s, federal and state agencies have buttressed and enabled the process of environmental change. Farm credit programmes, with their beginnings in the farm relief programmes of the 1930s, have been especially critical for maintaining agriculture. Farmers followed a fairly typical pattern of agriculturalists in the Great Plains. Their first attempts at sod-busting and crop production failed during every drought. Many left the area; some stayed. But, over time, irrigation, transportation, storage, production and marketing technologies, extension services, and credit formed the basis for economic success and market competitiveness. With higher fuel costs, less water, more competitors, smaller market shares, and lower soil fertility, that comparative advantage has slipped. The region is now one of the most technologically advanced agricultural systems in the United States. Many of the farmers have college degrees, and only the best managers have survived the 1980s. Even so, farm credit delinquencies, foreclosures, and bankruptcies are increasing. At the end of 1990, over 40 per cent of all Farmers Home Administration (FmHA) loans for the Southern High Plains were delinquent, and the majority of these were emergency loans (South Plains Association of Governments 1991). Meanwhile there is nowhere else to move, no extra margin for the moment. The transformation of the environment from a complex mature grassland to a monocropped agricultural/social landscape on the verge of collapse took very little time. In less than a generation, the change has become evident. The transformation took vast amounts of capital, technological development, institutional support, and human endeavour. If the history of the pre-European settlement of the Southern High Plains is a portrait of a stable, evolved, plant-wildlife ecosystem, with and without human occupancy, then the history of post-European settlement is really a history of forced adjustment, transplantation, and extinction. A major outcome of the Dust Bowl era is the full institutionalization of a way of life on the Llano Estacado. A policy and support infrastructure has propped up a farming-based culture, a regional economy, and a community network in an agriculturally marginal area. The environmental consequences, several of which are quite serious, serve to remind us that, despite all the human creativity and perseverance in building a life on the Southern High Plains, the effective curtailment of the technological inputs due to a dearth of investment capital and the scaling-back or outright removal of institutional interventions have propelled the region rapidly toward greater endangerment and risk of overall regional collapse.